The current won (원) does not officially have any hanja associated with it. The won (/wʌn/; Korean: 원, Korean pronunciation: [wʌn]; symbol: ₩; code: KRW) or the Korean Won is the currency of South Korea. A single won is divided into 100 jeon, the monetary subunit. The jeon is no longer used for everyday transactions, and appears only in foreign exchange rates. The won is issued by the Bank of Korea, based in the capital city of Seoul. The old "won" was a cognate of the Chinese yuan and Japanese yen. It is derived from the hanja 圓 (원), meaning "currency" or "coin." The won was subdivided into 100 jeon (Hangul: 전; Hanja: 錢; RR: jeon; MR: chŏn), itself a cognate of the Chinese character 錢 (qián) which means "money" and also used as a unit of money in ancient times.[when?] The current won (1962 to present) is written in hangul only and does not officially have any hanja associated with it. Prior to 1910, the won was the currency. During the colonial era under the Japanese (1910-45), the won was replaced by the Korean yen which was at par with the Japanese Yen. After World War II ended in 1945, Korea was divided, resulting in two separate currencies, both called won, for the South and the North. Both the Southern won and the Northern won replaced the yen at par. The first South Korean won was subdivided into 100 jeon. In 1946, the Bank of Joseon introduced 10- and 100-won notes. These were followed in 1949 by 5- and 1,000-won notes. A new central bank, the Bank of Korea, was established on 12 June 1950, and assumed the duties of Bank of Joseon. Notes were introduced (some dated 1949) in denominations of 5, 10 and 50 jeon, and 100 and 1,000 won. The 500-won notes were introduced in 1952. In 1953, a series of banknotes was issued which, although it gave the denominations in English in won, were, in fact, the first issues of the hwan. On February 27, 1980, efforts were initiated to lead to a floating exchange rate. The won was finally allowed to float on December 24, 1997, when an agreement was signed with the International Monetary Fund. Shortly after, the won was devalued to almost half of its value, as part of the East Asian financial crisis. Until 1966, 10- and 50-hwan coins, revalued as 1 and 5 won, were the only coins in circulation. New coins, denominated in won, were introduced by the Bank of Korea on August 16, 1966, in denominations of 1, 5 and 10 won, with the 1 won struck in brass and the 5 and 10 won in bronze. These were the first South Korean coins to display the date in the common era, earlier coins having used the Korean calendar. The 10- and 50-hwan coins were demonetized on March 22, 1975. In 1968, as the intrinsic value of the brass 1-won coin far surpassed its face value, new aluminium 1-won coins were issued to replace them. As an attempt to further reduce currency production costs, new 5- and 10-won coins were issued in 1970, struck in brass. Cupronickel 100-won coins were also introduced that year, followed by cupronickel 50 won in 1972. In 1982, with inflation and the increasing popularity of vending machines, 500-won coins were introduced on June 12, 1982. In January 1983, with the purpose of standardizing the coinage, a new series of 1-, 5-, 10-, 50-, and 100-won coins was issued, using the same layout as the 500-won coins, but conserving the coins' old themes. The Bank of Korea announced in early 2006 its intention to redesign the 10-won coin by the end of that year. With the increasing cost of production, then at 38 won per 10-won coin, and rumors that some people had been melting the coins to make jewelry, the redesign was needed to make the coin more cost-effective to produce. The new coin is made of copper-coated aluminium with a reduced diameter of 18 mm, and a weight of 1.22 g. Its visual design is the same as the old coin. The new coin was issued on December 18, 2006. The 1- and 5-won coins are difficult to find in circulation today, and prices of consumer goods are rounded to the nearest 10 won. However, they are still in production, minting limited amounts of these two coins every year, for the Bank of Korea's annual mint sets. In 1998, the production costs per coin were: 10-won coins each cost 35 won to produce, 100-won coins cost 58 won, and 500 won coins cost 77 won. The Bank of Korea designates banknote and coin series in a unique way. Instead of putting those of similar design and issue dates in the same series, it assigns series number X to the Xth design of a given denomination. The series numbers are expressed with Korean letters used in alphabetical order, e.g. 가, 나, 다, 라, 마, 바, 사. Therefore, ₩1,000 issued in 1983 is series II (나) because it is the second design of all ₩1,000 designs since the introduction of the South Korean won in 1962. In 1962, 10- and 50-jeon, 1-, 5-, 10-, 50-, 100- and 500-won notes were introduced by the Bank of Korea. The first issue of 1-, 5-, 10-, 50-, 100- and 500-won notes was printed in the UK by Thomas De La Rue. The jeon notes together with a second issue of 10- and 100-won notes were printed domestically by the Korea Minting and Security Printing Corporation. In 1965, 100-won notes (series III) were printed using intaglio printing techniques, for the first time on domestically printed notes, to reduce counterfeiting. Replacements for the British 500-won notes followed in 1966, also using intaglio printing, and for the 50-won notes in 1969 using lithoprinting. With the economic development from the 1960s, the value of the 500-won notes fell, resulting in a greater use of cashier's checks with higher fixed denominations as means of payment, as well as an increased use of counterfeited ones. In 1970, the 100-won notes were replaced by coins, with the same happening to the 50-won notes in 1972. Higher-denomination notes of 5,000 and 10,000 won were introduced in 1972 and 1973, respectively. The notes incorporated new security features, including watermark, security thread, and ultraviolet response fibres, and were intaglio printed. The release of 10,000-won notes was planned to be at the same time as the 5,000-won notes, but problems with the main theme delayed it by a year. Newly designed 500-won notes were also released in 1973, and the need for a medium denomination resulted in the introduction of 1,000-won notes in 1975. In 1982, the 500-won note was replaced by a coin. The following year, as part of its policy of rationalizing the currency system, the Bank of Korea issued a new set of notes, as well as a new set of coins. Some of the notes' most notable features were distinguishable marks for the blind under the watermark and the addition of machine-readable language in preparation for mechanization of cash handling. They were also printed on better-quality cotton pulp to reduce the production costs by extending their circulation life. To cope with the deregulation of imports of color printers and the increasing use of computers and scanners, modified 5,000- and 10,000-won notes were released between 1994 and 2002 with various new security features, which included color-shifting ink, microprint, segmented metal thread, moiré, and EURion constellation. The latest version of the 5,000- and 10,000-won notes are easily identifiable by the copyright information inscribed under the watermark: "© 한국은행" and year of issue on the obverse, "© The Bank of Korea" and year of issue on the reverse. The plates for the 5,000-won notes were produced in Japan, while the ones for the 1,000- and 10,000-won notes were produced by the Korea Minting and Security Printing Corporation. They were all printed in intaglio. With the release of a new set of notes, no plan has yet been made to withdraw these notes from circulation. In 2006, it became a major concern that the Korean won banknotes were being counterfeited/forged. Notably, around 50% of 5,000-won notes (worth about US$5) were confiscated as counterfeit. This led the government to issue a new series of banknotes, with the 5,000-won note being the first one to be redesigned. 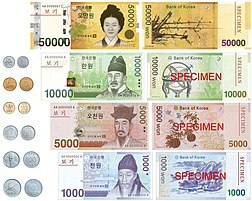 Later in 2007, the 1,000- and 10,000-won notes were introduced. On June 23, 2009, the Bank of Korea released the 50,000-won note. The obverse bears a portrait of Shin Saimdang, a prominent 16th-century artist, calligrapher, and mother of Korean scholar Yulgok, also known as Yi I, who is on the 5,000-won note. This note is the first Korean banknote to feature the portrait of a woman. The release of the 50,000-won note stirred some controversy among shop owners and those with visual impairments due to its similarity in color and numerical denomination with the 5,000-won note. New 100,000-won notes were also announced, but their release was later cancelled due to the controversy over the banknote's planned image, featuring the Daedongyeojido map, and not including the disputed Dokdo islands. Watermark portraits of the effigy of the note are visible when held to the light in the white section of the note. For the first time in the world, KOMSCO, the Korean mint, inserted a new substance in the notes to detect counterfeits. This technique is being exported to Europe, North America, etc. Intaglio latent image: From the position of eyes, if one looks askance at the note, "WON" appears, due to a special intaglio printing method. Windowed security thread: The security thread is a plastic film with hologram letters. It is exposed at the left side of the portrait on the obverse regularly. Color-shifting ink: Because of special ink, which is mixed with different material having different reflection to the light, the color of face-value number changes from green to blue. See-through register: Patterns are printed in the same place on both sides of the note. Holding the note up to the light, the shapes on the obverse and reverse combine to make a completed taegeuk. Microlettering: Difficult to see with the naked eye, it can be discerned with a magnifier. It appears as a line or dotted line when forged by color printer or color copier. Watermark: Held up to the light, a hidden reverse image portrait appears in the nonimage space on the left side of the obverse, due to the variation in thickness within each note. Special press and soldering: Without holding the note up to the light, the watermark can still be read because of higher differences in paper thickness. Intaglio printing: A special method applying ink to a concave plate, the slightly raised figures produced can be felt. Fluorescent security fiber: Fluorescent fibers are inserted into the paper. Under ultraviolet light, the fluorescent fibers can be seen scattered throughout. Rainbow printing: A printing method whereby color gradients give a rainbow-like effect. Hologram (optically variable device): Changing designs are seen at different angles. At different angles, "map of Korea", "face value number, and "Taegeuk" (the Great Absolute), and "Four signs of divination" can be seen. Color-shifting ink: Depending on the angle, the value (5,000) on the reverse changes between gold and green. Intaglio latent image: From the position of eyes, "WON" appears due to intaglio printing. Security thread: Held up to the light, the banknote shows microletters within a thin fluorescent plastic film. See-through register: Patterns are printed in the same place on both sides of the note. Microlettering: Difficult to see, it appears as a line or dotted line when forged by color printer or color copier. Watermark bar: Held up to the light, three horizontal dark bars and two bright bars appear, in turn, due to the variation in thickness within each note. Hologram: At different angles, "map of Korea," "face value number" and "Taegeuk "(the Great Absolute)," and "Four signs of divination" can be seen. Color shifting ink: Depending on the angle, the value (10,000) on the reverse changes between gold and green. Holographic strip (optically variable device): The holographic strip is a special film applied on the left end of the obverse. On the top, middle and bottom of the strip, are three sets of changing images: "map of Korea," "taegeuk (two comma roundel)," and "the four trigrams." When the banknote is tilted, each of them appears in turn. Between the sets of changing images, the denomination, 50,000, is printed vertically on the strip. On the left top and bottom of the holographic strip, against a background of geometric guilloche, the words "BANK OF KOREA 50000" are printed vertically. A line of a Korean traditional lattice pattern is embossed on the strip's right end. Moving image security thread ("Motion"): The 50,000 won note has a special blue and gray film with numerous Taegeuk patterns all over it. Taegeuk patterns move to the left and right when the note is tilted up and down, while moving up and down when the note is tilted to the left and right. When the note is held up to the light, the movement of the Taegeuk patterns appears more clearly. Novel numbering: The sizes of the digits (numbers and letters) used in the serial number increase gradually from left to right. Color-shifting ink: The color of the face value number (50,000) on the top right of the reverse changes between green and magenta when the note is tilted. Watermark: Held up to the light, a hidden portrait (of Shin Saimdang), produced by using the variation in thickness of the note paper, appears in the non-image area on the left side of the obverse. Special press and soldering: A kind of watermark, it isproduced using the maximized thickness variations in the note paper. It is located on the right bottom of the watermark and if one holds the banknote up to a light source or looks at it with the naked eye, the number "5" appears within the pentagon. Intaglio latent image: If the note is held horizontally and tilted at eye level, the number "5" appears within the intaglio-printed pentagon. Security thread: If the note is held up to the light, the microletters "한국은행 BANK OF KOREA 50000" are printed within a special film hidden on the right side of the portrait. Intaglio printing: Granular texture can be felt when touching the portrait of Shin Saimdang, the Wolmaedo painting, letters, five lines of tactile marks and denomination numbers. See-through register: When the note is held up to the light, the round images on the obverse and reverse are combined, appearing as a two-comma roundel (Taegeuk). Fluorescent security ink and fiber: When the note is illuminated with ultraviolet light, fluorescent green (security ink) on the grape painting and short fluorescent red, blue and green lines (fluorescent security fibers) show all over the banknote. Filter through latent image: Through a specially produced filter, the hidden face value number "50000" is seen in the nonimage area of the reverse. Microlettering: Intaglio-printed microletters (consonants of Korean alphabets and "BANK OF KOREA") and offset-printed microletters ("50000") can be discerned with a magnifying glass. As the South Korean economy is evolving through the use of electronic payments, coins of the South Korean won are becoming less used by consumers. The Bank of Korea began a trial which would result in the total cessation of the production of coins of the South Korean won. The Bank of Korea is the only institution in South Korea with the right to print banknotes and mint coins. The banknotes and coins are printed at KOMSCO, a government-owned corporation, under the guidance of the Bank of Korea. After the new banknotes and coins are printed/minted, they are bundled or rolled and shipped to the headquarters of the Bank of Korea. When delivered, they are deposited inside the bank's vault, ready to be distributed to commercial banks when requested. Every year, around Seollal and Chuseok, two major Korean holidays, the Bank of Korea distributes large amounts of its currency to most of the commercial banks in South Korea, which are then given to their customers upon request. South Korean won exchange rate against U.S. dollar (from 1990) and Euro (from 1999). ^ "won". OxfordDictionaries.com. Oxford University Press. Retrieved 8 January 2017. ^ Linzmayer, Owen (2012). "South Korea". The Banknote Book. San Francisco, CA: www.BanknoteNews.com. ^ Kurt Schuler (29 February 2004). "Tables of modern monetary history: Asia". Currency Boards and Dollarization. Archived from the original on 2007-01-12. Retrieved 2006-11-16. ^ a b c d e f "Currency Issue System". Bank of Korea. Archived from the original on 2006-08-26. Retrieved 2006-11-09. ^ 부산본부 (12 December 2006). 새 10원 동전, 12. 18(월)부터 발행 (in Korean). Bank of Korea. Archived from the original (hwp) on March 12, 2007. Retrieved 2006-12-12. ^ "New W10 Coin to Debut". The Korea Times. 13 January 2006. Archived from the original on January 15, 2006. Retrieved 2006-12-11. ^ "New 10-won Coins to Debut". KBS Global. 10 August 2006. Archived from the original on March 21, 2008. Retrieved 2006-12-11. ^ 1원짜리 만한 10원 동전 18일 나온다 (in Korean). Daum Media. 11 December 2006. Archived from the original on 16 October 2007. Retrieved 2006-12-11. ^ "New 10-won Coins to Debut Next Week". KBS Global. 11 December 2006. Archived from the original on 18 June 2008. Retrieved 2006-12-12. ^ Bank of Korea Mint Sets - 한국은행 민트 세트 Dokdo Research (dokdoresearch.com). Retrieved on 2017-07-05. ^ "Coins Return to the Bank". The Chosun Ilbo. 19 February 1998. Archived from the original on September 9, 2004. Retrieved 2007-03-26. ^ a b c d "Brief History of current Korea notes in circulation; 10,000 won note". Bank of Korea. Archived from the original (Flash and HTML) on 2017-05-05. Retrieved 2016-01-13. ^ a b c "Brief History of current Korea notes in circulation; 5,000-won note". Bank of Korea. Archived from the original (Flash and HTML) on 2007-09-27. Retrieved 2006-11-09. ^ a b "Brief History of current Korea notes in circulation; 1,000 won note". Bank of Korea. Archived from the original (Flash and HTML) on 2007-09-27. Retrieved 2006-11-09. ^ Bank of Korea (26 July 2006). "Issue of New 10,000-won Notes and 1,000-won Notes on January 22, 2007" (PDF). Archived from the original (PDF) on 14 June 2007. Retrieved 2006-10-17. ^ "W50,000 Bill Unveiled". english.chosun.com. 2009-02-26. Archived from the original on March 1, 2009. Retrieved 2016-01-13. ^ "ANN". Asianewsnet.net. Archived from the original on 2011-06-15. Retrieved 2013-07-26. ^ "50,000-Won Banknote to Be Issued in May". Koreatimes.co.kr. 2009-01-27. Retrieved 2012-09-01. ^ "50,000-Won Banknote to Be Issued in May". Koreatimes.co.kr. 2009-01-27. Retrieved 2014-02-09. ^ "Debut of W100,000 Note Delayed Indefinitely". English.donga.com. 2009-01-01. Retrieved 2014-02-13. ^ "SKorea shelves new banknote". News.asiaone.com. 2008-12-18. Retrieved 2014-02-13. ^ "Currency < Currency in circulation < Introduction to Banknotes | THE BANK OF KOREA. #2". Bok.or.kr. Archived from the original on 2015-09-23. Retrieved 2012-09-01. ^ Security features of the 1,000 won banknote Archived 2015-09-23 at the Wayback Machine The Bank of Korea (www.bok.or.kr). Retrieved on 2014-08-25. ^ Security features of the 5,000 won banknote Archived 2015-09-23 at the Wayback Machine The Bank of Korea (www.bok.or.kr). Retrieved on 2014-08-25. ^ Security features of the 10,000 won banknote Archived 2015-09-23 at the Wayback Machine The Bank of Korea (www.bok.or.kr). Retrieved on 2014-08-25. ^ South Korea begins coinless society trial BBC (www.bbc.com). April 19, 2017. Retrieved on 2017-07-14. Krause, Chester L.; Clifford Mishler (2003). 2004 Standard Catalog of World Coins: 1901–Present. Colin R. Bruce II (senior editor) (31st ed.). Krause Publications. ISBN 0873495934. Wikimedia Commons has media related to Money of South Korea. "BOK Announces Smaller Banknotes". The Chosun Ilbo. 2005-07-21. Archived from the original on 2006-10-26. Retrieved 2006-10-17. "New W5,000 Ready for Release on Jan. 2". The Chosun Ilbo. 2005-12-13. Archived from the original on 2006-10-26. Retrieved 2006-10-17. "New W1,000 Note Unveiled". The Chosun Ilbo. 2006-01-17. Archived from the original on 2006-10-26. Retrieved 2006-10-17. "Dollar Plummets to Pre-Crisis Level Against Won". The Chosun Ilbo. 2006-01-25. Archived from the original on 2006-10-26. Retrieved 2006-10-17. "New W5,000 Bills Forgery- but not Water-Proof". The Chosun Ilbo. 2006-01-25. Archived from the original on 2006-10-26. Retrieved 2006-10-17. "New W10,000 Note Unveiled". The Chosun Ilbo. 2006-05-18. Archived from the original on 2006-07-09. Retrieved 2006-10-17. Heiko Otto (ed.). "The banknotes of South Korea" (in English and German). Retrieved 2018-10-21.